This piece explores the complex nature of Arab feminine identity through the lens of past and present by pulling inspiration from several iconic 19th century American and European Orientalist paintings. 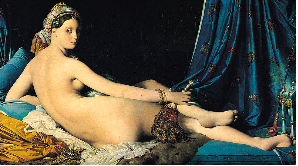 For example, one photo is posed like Jean-Auguste-Dominique Ingre’s Grand Odalisque. Essaydi recreates these depictions without male figures and elegant details so that the women become the sole focal point of the piece. She also displays small copies of the Orientalist original nearby on the wall to help visitors make the connection. 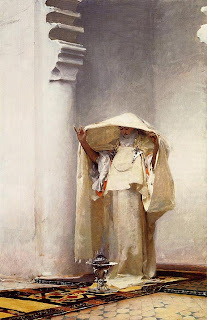 She deliberately poses Moroccan women in draping white fabric. She illustrates, with henna, Arabic calligraphic script writings from her own personal journal that cover every surface of the print. In the past, calligraphy was an art form practiced exclusively by men for the transcriptions of sacred texts. One of the purposes of Essaydi’s photographs is to eliminate the original Orientalist photos of their misogynistic and Euro-centric discourse. Historically, Orientalist paintings were used to eroticize the Middle East, thus giving Europeans a view of a mysterious land and the “new Islamic world.” Each woman in the set of photos has a moderately to openly hostile expressions. 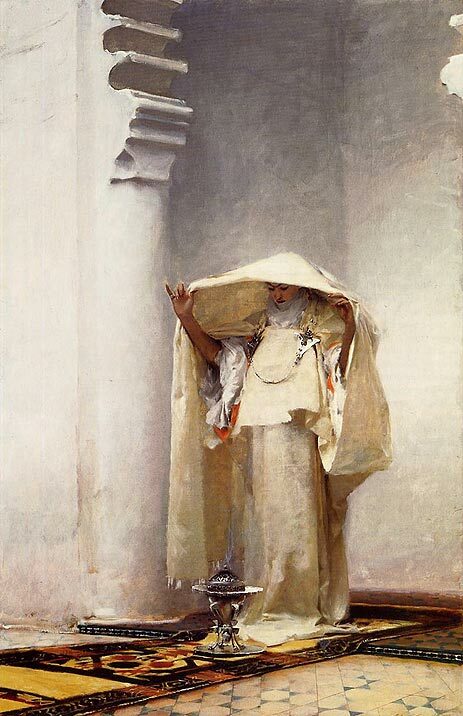 "I always had this love-hate [relationship] with Orientalist paintings," Essaydi said. "I find them exquisite but at the same time, the content is absolutely outrageous." 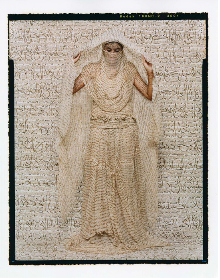 Throughout her work, Essaydi wishes to present herself though multiple, diverse lenses—as an artist, a Moroccan, a liberal, a traditionalist, and a Muslim. She invites viewers to resist stereotypes with her images. This particular piece, absent of male figures, functions to take the power back from the original Orientalist images and redistributes the power to these women and to all women who are objectified. She challenges the archaic view of the exotic, unexplored, Muslim woman and aims to create a more honest view of Muslim women. 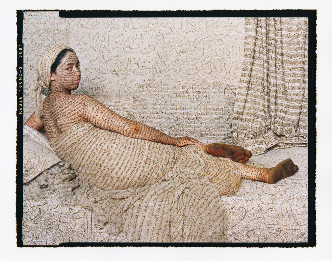 Thus, she challenges the idea of each woman as “the Other” in the original Orientalist depictions. She wanted to give the real image of the Moroccan women she knows. “She is not repressed - she has determination and creativity like any man or like any woman in the West or any other part of the world!" exclaims Essaydi. This sort of influence would be very powerful if it were spread more widely and throughout more of popular culture. This painting was purchased by the Louvre and can be seen in the Zimmerli Art Museum at Rutgers. Art is often considered high culture and inaccessible to the general public. Low culture seems to only show that Muslim women are oppressed and that cultural relativism isn’t something we have time to be concerned with. Does accessibility to low and high culture inform how we view a culture? Since certain people do not have the luxury to go to visit such an exhibit, do they not have the same impression of Islamic Women? As stated in “Racism in the Name of Feminism: Imperilled Muslim Women in Norway,” the body of the Muslim woman is fixed in the Western imaginary as confined, mutilated, and sometimes murdered in the name of culture. The argument here is that this idea serves to reinforce the threat that Muslim men pose to the West. Cultural relativism is the principle that the standards of one culture cannot be used to understand or judge another culture. People that are not directly part of Muslim culture presume to know how Muslim men oppress Muslim women. We must use positive expressions such as this one to stop “othering”. If more people could see and experience this exhibit, preconceived notions about Muslim women and oppression of all Muslim women would be challenged. Razack, Sherene. Racism in the Name of Feminism: Imperilled Muslim Women in Norway. University of Toronto Press. 107-144.